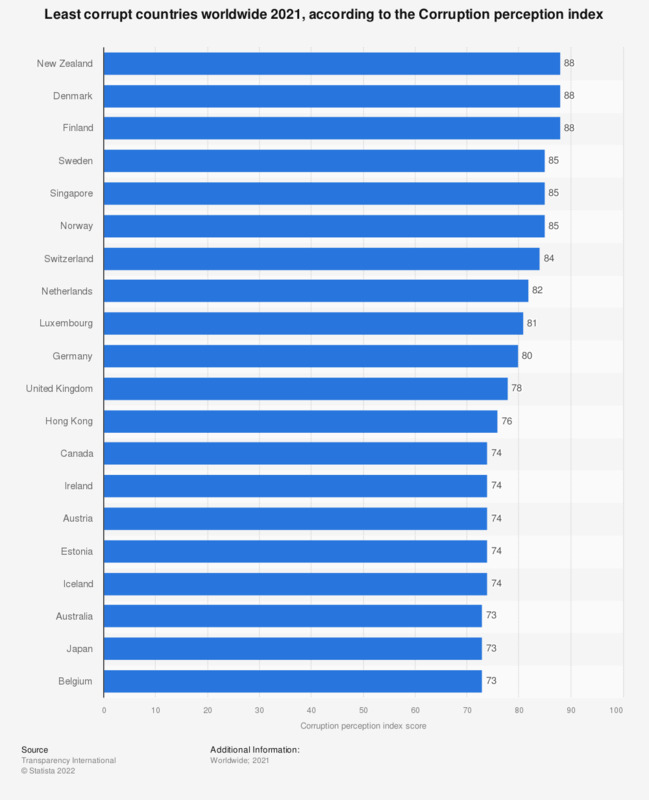 This statistic shows the least corrupt countries as calculated by the Corruption Perception Index in 2018. Points considered when calculating the perception of countries levels of corruption include: bribery of public officials, kickbacks in public procurement, embezzlement of state funds, and how effective public sector anti-corruption efforts have proven to be. A score of 0 indicates high perceptions of corruption and a score of 10 indicates that no corruption is perceived in the respective country. According to the index, Denmark is perceived to be the least corrupt country in the world with a score of 88. To compile the corruption perception index data is pooled from various surveys and studies and a score between 0 and 10 is calculated. A score of 0 indicates high perceptions of corruption and a score of 10 indicates that no corruption is perceived in the respective country. The original author does not provide details of exactly where data is sourced from to calculate this index.